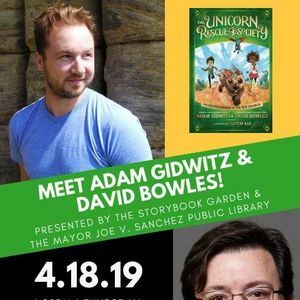 Meet Adam Gidwitz & David Bowles! Adam & David are coming to town to talk about their collaboration on the latest installment of THE UNICORN RESCUE SOCIETY: THE CHUPACABRAS OF THE RIO GRANDE! This event is free; however, to get in the book signing line, a copy of THE CHUPACABRAS OF THE RIO GRANDE must be purchased from The Storybook Garden. The event is free; however, to get in the book signing line we kindly ask that a copy of Adam's or David's books be purchased from The Storybook Garden. Books will be available for purchase at the event. Pura Belpré Honor-winning author David Bowles joins Newbery Honor-winning Adam Gidwitz as co-author of the newest Unicorn Rescue Society adventure, as the kids travel to the U.S.-Mexican border to help the legendary chupacabras. Elliot and Uchenna have only just returned from their most recent Unicorn Rescue Society mission when Professor Fauna whisks them away (Jersey, too! ), on their next exciting adventure. This time, they’re headed to Laredo, on the U.S.-Mexican border to help another mythical creature in need: the chupacabras. Teaming up with local kids Lupita and Mateo Cervantes–plus their brilliant mother, Dr. Alejandra Cervantes and her curandero husband Israel–the kids struggle to not only keep the chupacabras safe, but also to bring a divided community together once more. About Adam Gidwitz: Adam Gidwitz is the author of the critically acclaimed, New York Times bestselling Grimm trilogy. He spent six years researching and writing his Newbery Honor-winning The Inquisitor's Tale, including a year living in Europe. Adam lives with his family in Brooklyn, NY. About David Bowles: David Bowles is a Mexican-American author from south Texas, where he teaches at the University of Texas Río Grande Valley. He has written several titles, most notably The Smoking Mirror (Pura Belpré Honor Book) and They Call Me Güero (Tomás Rivera Mexican American Children’s Book Award, Claudia Lewis Award for Excellence in Poetry, Pura Belpré Honor Book, Walter Dean Myers Honor Book). His work has also been published in multiple anthologies, plus venues such as Asymptote, Strange Horizons, Apex Magazine, Metamorphoses, Rattle, Translation Review, and the Journal of Children’s Literature. In 2017, David was inducted into the Texas Institute of Letters. Karaoke Time! No school tomorrow!